“Prayer Time in the Nursery” by Jacob Riis from How the Other Half Lives. Photojournalism is a particular form of journalism (the collecting, editing, and presenting of news material for publication or broadcast) that creates images in order to tell a news story. It is usually understood to refer to still images, and although in some cases also to video, used in television broadcast journalism. Photojournalism, as a descriptive term, often implies the use of a certain bluntness of style or approach to image-making. The photojournalist approach to candid photography is becoming popular as a unique style of commercial photography. Photojournalists must make decisions instantly and carry equipment such as cameras, often while exposed to the same risks (war, rioting, and so forth) that are faced by text-only journalists. The fact that they rarely have the option to stand back or wait until the danger is over means they may take even more risks. As with all involved in communicating news and information to the public, photojournalists have a responsibility to maintain standards of ethics, both in their choice of subject matter and their relationship to those they photograph. When such standards are upheld, photojournalism plays a significant role in raising the awareness of all people regarding the lives of other human beings and issues that face the world. The invention of the term "photojournalism" is often attributed to Cliff Edom (1907–1991), who taught at the University of Missouri School of Journalism for 29 years. Edom established the first photojournalism program there, and created the Missouri Photographic Workshop in 1946. Edom said, during the judging of the 1989 Pictures of the Year Contest (which he also founded), that the then-dean of the School of Journalism, Frank L. Mott actually coined the word. Photojournalism is distinguished from other close branches of photography (such as documentary photography, street photography, or celebrity photography) by the qualities of timeliness (the images have meaning in the context of a published chronological record of events), objectivity (the situation implied by the images is a fair and accurate representation of the events they depict), and narrative (the images combine with other news elements, to inform and give insight to the viewer or reader). Though the term was originally coined for reference to still photography, video journalism is used in the same context to refer to the telling of a story through the use of images. The main difference, of course, being that the images in video journalism are moving. The same objectives apply to both photojournalism and video journalism. The practice of illustrating news stories with photographs was made possible by printing and photography innovations that occurred between 1880 and 1897. While newsworthy events were photographed as early as the 1850s, printed news stories were illustrated with wood engravings exclusively until the 1880s. News photographs had to be reinterpreted by an engraver before publication in order to be compatible with the printing presses of the time. 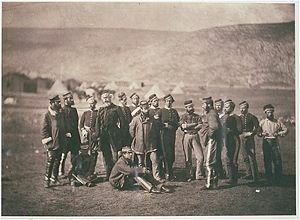 The pioneering battlefield photographs from the Crimean War (1853–1856) by British press reporters such as William Simpson of the Illustrated London News and Roger Fenton were published as engravings. Similarly, the American Civil War photographs of Mathew Brady were engraved before publication in Harper's Weekly. Because the public craved more realistic representations of news stories, it was common for newsworthy photographs to be exhibited in galleries or to be copied photographically in limited numbers. ”Bandit's Roost” by Jacob Riis, 1888, from How the Other Half Lives. 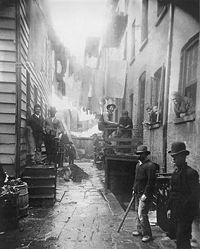 This image is Bandit's Roost at 59½ Mulberry Street, considered the most crime-ridden, dangerous part of New York City. On March 4, 1880, the Daily Graphic (New York) published the first halftone (rather than engraved) reproduction of a news photograph. Further innovations followed. In 1887, flash powder was invented, enabling journalists such as Jacob Riis to photograph informal subjects indoors. By 1897, it became possible to reproduce halftone photographs on printing presses running at full speed. Despite these innovations, limitations remained, and many of the sensational newspaper and magazine stories in the period from 1897 to 1927 (see yellow journalism) were illustrated with engravings. In 1921, the wirephoto made it possible to transmit pictures almost as quickly as news itself could travel. However, it was not until development of the commercial 35mm Leica camera in 1925, and the first flash bulbs between 1927 and 1930, that all the elements were in place for a "golden age" of photojournalism. In the "golden age" of photojournalism (1930s–1950s), some magazines, such as London’s Picture Post, Paris’s Paris Match, and Life and Sports Illustrated in the U.S., and newspapers like London’s Daily Mirror and New York’s Daily Graphic, built their huge readerships and reputations largely on their use of photography, and photographers such as Robert Capa, Alfred Eisenstaedt, Margaret Bourke-White, and W. Eugene Smith became well-known names. 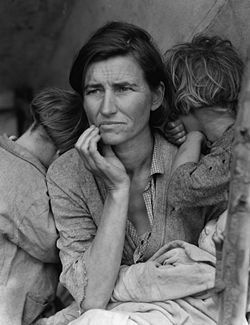 In “Migrant Mother.” Dorothea Lange produced this seminal image of the Great Depression. Until the 1980s, most large newspapers were printed with turn-of-the-century “letterpress” technology using easily smudged oil-based ink, off-white, low-quality “newsprint” paper, and coarse engraving screens. While letterpresses produced legible text, the photoengraving dots that formed pictures often bled or smeared and became fuzzy and indistinct. In this way, even when newspapers used photographs well—a good crop and a respectable size—murky reproduction often left readers rereading the caption to see what the photo was all about. Not until the 1980s had a majority of newspapers switched to “offset” presses that reproduce photos with fidelity on better, whiter paper. By contrast Life, one of America’s most popular weekly magazines from 1936 through the early 1970s, was filled with photographs reproduced beautifully on oversize 11×14-inch pages, using fine engraving screens, high-quality inks, and glossy paper. Life often published a United Press International (UPI) or Associated Press (AP) photo that had been first reproduced in newspapers, but the quality magazine version appeared to be a different photo altogether. In large part because their pictures were clear enough to be appreciated, and because their name always appeared with their work, magazine photographers achieved near-celebrity status. Life became a standard by which the public judged photography, and many of today’s photo books celebrate “photojournalism” as if it had been the exclusive province of near-celebrity magazine photographers. The Best of Life (1973), for example, opens with a two-page (1960) group shot of 39 justly famous Life photographers. But 300 pages later, photo credits reveal that scores of the photos among Life’s “best” were taken by anonymous UPI and AP photographers. Thus, even during the golden age, because of printing limitations and the UPI and AP syndication systems, many newspaper photographers labored in relative obscurity. Since the late 1970s, however, photojournalism and documentary photography have increasingly been accorded a place in art galleries alongside fine art photography. Luc Delahaye and Chien-Chi Chang are among many who are regularly exhibited in galleries. The Danish Union of Press Photographers (Pressefotografforbundet) was the first national organization for newspaper photographers in the world. It was founded in 1912 in Denmark by six press photographers in Copenhagen. Today it has nearly 800 members. The National Press Photographers Association (NPPA) was founded in 1946 in the U.S., and has about 10,000 members. Other professional organizations around the world include the British Press Photographers Association (BPPA) (1984, relaunched in 2003); Northern Ireland Press Photographers Association (2000); Pressfotografernas Klubb (Sweden, 1930); and Fotojournalisten (Norway). News organizations and journalism schools have many different awards for photojournalists. Since 1968, Pulitzer Prizes have been awarded for the following categories of photojournalism: Feature Photography, Spot News Photography, and Capture the Moment. Other awards include World Press Photo, Best of Photojournalism, and Pictures of the Year, as well as the UK-based The Press Photographer's Year. Photographers crowd around a starlet at the Cannes Film Festival. Photojournalism works within the same ethical approaches to objectivity that apply to other journalists. What to shoot, how to frame, and how to edit are constant considerations. Often, ethical conflicts can be mitigated or enhanced by the actions of a subeditor or picture editor, who takes control of the images once they have been delivered to the news organization. The photojournalist often has no control as to how images are ultimately used. The U.S. National Press Photographers Association, and other professional organizations, maintain codes of ethics to specify approaches to these issues. Major ethical issues are often inscribed with more or less success into law. Laws regarding photography can vary significantly from nation to nation. The legal situation is further complicated when one considers that photojournalism made in one country will often be published in many other countries. Smaller, lighter cameras greatly enhanced the role of the photojournalist. Since the 1960s, motor drives, electronic flash, auto-focus, better lenses, and other camera enhancements have made picture taking easier. New digital cameras free photojournalists from the limitation of film roll length, as hundreds of images can be stored on a single microdrive or memory card. The emergence of digital photography offers whole new realms of opportunity for the manipulation, reproduction, and transmission of images. It has inevitably complicated many of the ethical issues involved. Content remains the most important element of photojournalism, but the ability to extend deadlines with rapid gathering and editing of images has brought significant changes. As recently as 15 years ago, nearly 30 minutes were needed to scan and transmit a single color photograph from a remote location to a news office for printing. Now, equipped with a digital camera, a mobile phone, and a laptop computer, a photojournalist can send a high-quality image in minutes, even seconds after an event occurs. Video phones and portable satellite links increasingly allow for the mobile transmission of images from almost any point on the earth. There is some concern by news photographers that the profession of photojournalism as it is known today could change to such a degree that it is unrecognizable as image-capturing technology naturally progresses. There is also concern that fewer print publications are commissioning serious photojournalism on timely issues. ↑ Paul Lester, The Merger of Photojournalism and Ethics, Photojournalism: An Ethical Approach (1999). Retrieved March 11, 2007. ↑ Robert Taft, Photography and the American Scene: A Social History, 1839–1889 (New York: Dover, 1964), 446; and W. Joseph Campbell, "1897: American journalism's exceptional year," Journalism History 29 (2004). ↑ Jens Tønnesen, Pressefotografforbundet History, PressefotografforBundet. Retrieved February 25, 2007. ↑ National Press Photographers Association. Retrieved April 13, 2007. ↑ British Press Photographers Association; Northern Ireland Press Photographers Association; Pressfotografernas Klubb; and Fotojournalisten. All sites retrieved April 13, 2007. ↑ World Press Photo; Best of Photojournalism; Pictures of the Year; and The Press Photographer's Year. All sites retrieved April 13, 2007. ↑ USNPPA Code of Ethics. National Press Photographers Association. Retrieved February 25, 2007. This page was last modified on 27 March 2019, at 14:57.